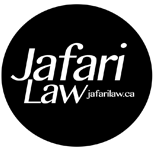 The herein terms and conditions of use govern your use of the Jafari Law Website, www.jafarilaw.ca, and its content (collectively the “Website“). Each time you use the Website you signify your acceptance and agreement of these terms and conditions in full (the “Agreement”); accordingly, if you disagree with these terms and conditions or any part of these terms and conditions, you must not use the Website. No lawyer-client, advisory, or fiduciary relationship is created by this Agreement or your use of the Website or your communication with a Jafari Law through the Website. The Website contains general information about the law and legal practice, which information may be out of date. This information is not legal advice and should not be treated as such as it may not apply to your circumstances. You must have personalized assessment and/or consultation to receive legal advice. You must not rely on the information on the Website as an alternative to legal advice from your lawyer or other professional legal services provider. You should never delay seeking legal advice, disregard legal advice, or commence or discontinue any legal action because of information on the Website. The website includes interactive features that allow users to communicate with Jafari Law. You acknowledge that, because of the limited nature of such communication, any assistance you may receive using any such facility is likely to be incomplete and may be misleading. As all communications can be intercepted or otherwise used or communicated by an unintended third party or may not be delivered to each of the parties to whom they are directed and only to such parties, Jafari Law cannot guarantee nor warrant that communications from it will be properly delivered or that partial and/or total loss of data may not result. The Website should not be used to transmit to Jafari Law any confidential information. Information transmitted to Jafari Law through the Website may not be secure, may not be treated as confidential or protected by lawyer-client privilege, and does not create any relationship or duty of any kind. Given the intended perfunctory nature of communications to Jafari Law through the Website, you understand that any communication stemming therefrom is of limited use, intended only to facilitate the booking of a consultation to address your specific legal needs. As such, you recognize that communications with Jafari Law enabled through the Website do not constitute legal advice and do not form a solicitor-client relationship. The Website may be used only by persons who are at least 18 years old and can form legally binding contracts under applicable law. Parents are reminded that there are parental control tools available online that can be used to prevent children from submitting information online without parental permission or from accessing material that is harmful to minors. Unauthorized use of the Website in connection with the transmission of unsolicited e-mails, including the transmission of e-mails in violation of this policy, the Personal Information Protection and Electronic Documents Act (PIPEDA) or Canada’s Anti-Spam Legislation (CASL) may result in civil, criminal, or administrative penalties being levied against the sender of same and those assisting the sender. Jafari law does not accept any liability for your use of the Website. Your use of the Website is at your own risk. The Website is provided on an “as is” and “as available” basis, without any representations, warranties or conditions of any kind, whether express or implied, and including without limitation implied representations, warranties or conditions of title, non-infringement, merchantability, fitness for a particular purpose, performance, durability, availability, timeliness, accuracy, or completeness, all of which are hereby disclaimed by Jafari Law to the fullest extent permitted by law. Jafari Law will not under any circumstances be liable to you or any other person for any loss or damage arising from, connected with, or relating to the use of the Website by you or any other person. Jafari Law does not warrant that the Website will operate in an uninterrupted or error-free manner or that the Website is free of viruses or other harmful components. Use of information obtained from or through the Website is at your own risk. You agree to indemnify and hold Jafari Law and the Website and their affiliates harmless from any claims, lossess or damages, including legal fees, resulting from your violation of these Terms and Conditions of Use or your use of the Website. The Website, including all of its content, is the property of Jafari Law, and is protected by Canadian copyright, trade-mark, and other laws. Your use of the Website does not transfer to you any ownership or other rights in the Website or its content. The Website is made available to you for your lawful, personal, non-commercial use only. You may print or download Website pages for your personal, non-commercial use provided that you do not modify any of the Website pages or other content and you do not remove or alter any visible or non-visible identification, marks, notices, or disclaimers. You may not use the Website or its content for any other purpose or in any other way. In particular, the Website and its content may not be copied, imitated, reproduced, republished, uploaded, posted, transmitted, modified, indexed, catalogued, mirrored or distributed in any way, in whole or in part, without the express prior written consent of Jafari Law. You may not reproduce or store any part of the Website without our prior consent. To request permission or consent, please contact Jafari Law at info@jafarilaw.ca. If you breach any provision of this Agreement, you may no longer use the Website. Jafari Law may, at any time and for any reason and in its sole discretion, change, suspend or terminate, temporarily or permanently, the Website or any part of it, or your permission to use the Website, without any prior notice or liability to you or any other person. Jafari Law may, in its sole discretion, change, and supplement or amend this Agreement as it relates to your future use of the Website from time to time, for any reason, and without any prior notice or liability to you or any other person. You may not change, supplement, or amend this Agreement in any manner.